On the day of the third #YouthStrike4Climate, the UK Student Climate Network (UKSCN) came out in support of a Green New Deal. Demonstrations in March saw over 50,000 students and young people strike nationwide under demands for the government to urgently address climate change. 70 locations held demos with thousands turning out in London. Principally a rapid mobilisation inspired by a broad outrage at government inaction, this movement is quickly finding its feed politically. 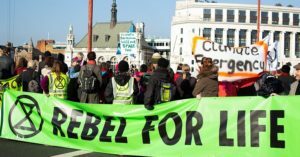 In a statement, the group behind the youth strikes in the UK laid out the need for “a political and economic transformation that will work in the interests of people and planet, while addressing the climate crisis on a timescale that recognises the severity of our planetary situation.” The radical framing here is significant. Importantly, it is substantiated by the principles for a Green New Deal UKSCN endorse. These demands illustrate a holistic analysis of climate breakdown’s underlying connection to wider social injustices. The call for complete decarbonisation is backed up by demands for economic justice in the recognition that these crises share the same root. 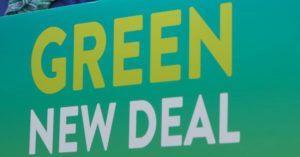 They demonstrate the need for a Green New Deal to restore wider ecological stability and resilience to climate shocks to underwrite the sustainability of those social gains. UKSCN’s support for the Green New Deal coincides with the climate movement’s left-turn across the Atlantic. In the US, the plan has been popularised by Alexandria Ocasio-Cortez, democratic socialist Member of Congress, alongside the youth-led grassroots Sunrise Movement. In the UK, it originated as a response to the 2008 financial crisis. Since, it has been picked up by Labour Party members, through Labour for a Green New Deal, emboldened by Jeremy Corbyn’s leadership to demand a radical response to climate and economic injustices. This political context is important. It has been too easy for those looking in on #YouthStrike4Climate to default towards telling a story where the youth strikers are assigned an incontrovertible moral authority insulated from criticism or condemnation because of their perceived innocence. The young people calling for climate justice are not innocent and their ask is not even a moral one. Driven to take action, they are informed by their education, experience and political context. Their demands are political; they know what they’re against, and they know what they’re for. To adequately address the climate crisis, we need bold and ambitious ideas that inspire people to think of a better world. A Green New Deal is one such solution. 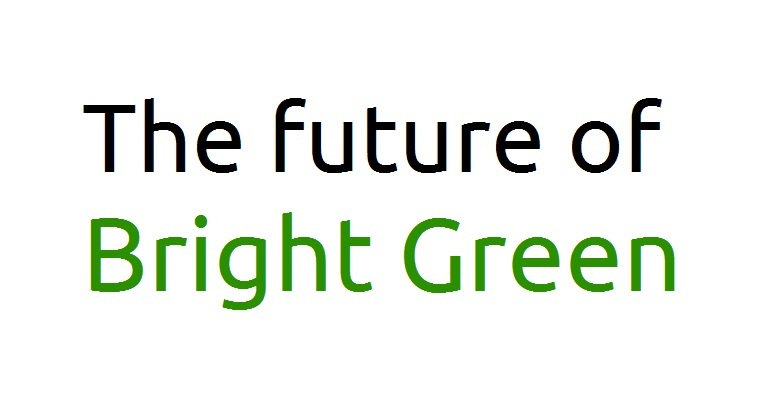 With a promise of well paid and secure jobs in the renewable and other green sectors, it would go a long way toward addressing the economic inequality that has disproportionately affected so many communities and regions around the UK as well as tackling climate change. Embracing the Green New Deal is a rejection of austerity ideology which has gripped British politics since 2010 and mainstream environmental politics for even longer. For a movement that is looking to the future and imagining a ‘better world’, it makes sense that they channel the Green New Deal’s optimism for a world where climate stability is delivered in tandem with rebalancing the economy to eliminate inequality. Many will continue to attempt to flatten the intensely political nature of #youthstrike4climate either to co-opt or pacify the insurgent mobilisations. 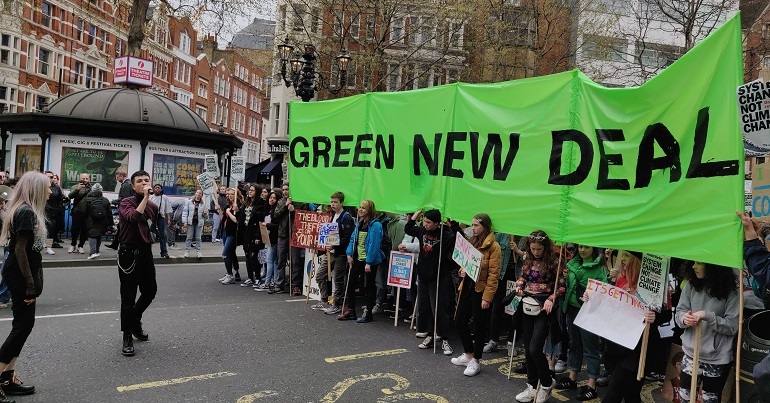 But by coming out for the Green New Deal, UKSCN remind us all that young people in the UK are political agents have a radical outlook and a vision for the future. Patronise them at your own risk. Chris Saltmarsh is a socialist and climate justice organiser based in Oxford. 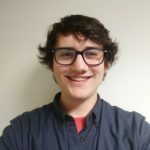 He is Co-Director: Climate Change Campaigns at student activist network People & Planet, where he manages the fossil fuel divestment and fossil free finance campaigns. He is also a member of direct-action network Reclaim the Power and of the Labour Party. He mostly writes about climate politics, social movements and the labour movement.